Since the subject of the secretarial art has been broached, and since we have had occasion to mention those who unworthily don its robes and thereby encroach upon its sublime offices, it is fitting that I describe what it is. Indeed, it is appropriate that I bedeck the end of this book with a description of those men whom the secretarial art has adorned and that I offer a sample of their merits. Therefore I would state clearly that the secretarial art is a noble craft, a splendid and lofty rank for those who master it. He who is ignorant of its excellence has surely never known one of its true practitioners. As for those secretaries worthy of the name, they are in truth the very meaning of existence; they are the kernel within the shell of this present world, the spirit in the body of this creation and the sheen upon its mirror, which reveals all excellence in its perfect clarity. 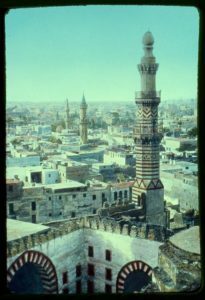 “Cairo from the Mosque of Ibn Touloun.” Public domain via the Library of Congress. One of the most renowned secretaries and noted men of culture was ʿAbd al-Ḥamīd ibn Yaḥyā, the secretary of the last Umayyad caliph, Marwān, who was killed at Būṣīr Sidr in the vicinity of Giza. ʿAbd al-Ḥamīd was the first to elucidate the proper methods that guide the secretarial art and the use of the pen, and to formulate the conventions of composition and rhetoric. He has many well-known epistles and many praiseworthy virtues as well. Am I to be loyal in secret and flaunt perfidy? what excuse could I give to convince people? Thereafter ʿAbd al-Ḥamīd stayed at Marwān’s side until he was slain by Ṣāliḥ ibn ʿAlī. 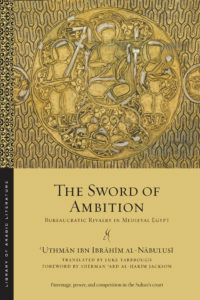 For more stories of the best—and worst—secretaries in history according to Ibn al-Nabulusi, check out The Sword of Ambition, newly published in paperback.